Muskie, musky, muscallonge, milliganong, maskinonge. Muskellunge are long, slender fish with a large duckbill shaped mouth and needle sharp teeth. The dorsal fin is soft and located near the tail.They have dark spots or wavy lines on their sides on a light background. Around 6 feet (1.8 m) in length and 65 pounds (29.4 kg), though it is believed that muskie can get several pounds bigger than that. Predominantly in and around the St. Lawrence/Great Lakes region on both sides of the border, but also in pockets as far south as Tennessee and far north as Hudson Bay basin. Prime muskellunge habitat is found in heavily vegetated lakes with lots of tree stumps and bays. Prime stream muskellunge habitat is generally considered to be long pools with a minimum depth of at least three to four feet (1m) and an abundance of submerged woody structure. Fish, crayfish, frogs, ducklings, mammals such as muskrat, and basically anything else it can fit in its mouth. Muskellunge usually spawn in April and early May when water temperatures are in the low to mid-50s (10°C). Females will lay as many as 200,000 eggs on soft shallow substrate where they adhere to vegetation and other objects. Muskies have a notoriously ow reproductive rate. Muskie have few natural predators apart from bigger muskie and pike and large marine birds. A musky is actually the largest member of the pike family, and though they look and act very similar to the northern pike and the American pickerel, they are indeed a different species altogether. 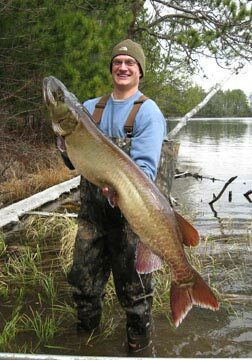 It is not uncommon for a musky to grow to an impressive length of nearly 5 feet and weigh over 60 lbs. They are predatory fish that like to lie in wait in the weeds growing in the water, gaming for an opportunity to catch their prey off guard and ambush them. For this reason, you might consider a musky somewhat similar to a python: a long, powerful predator that bides its time before showing its quarry no mercy. While their markings will vary depending upon the type of water they are in, these fish all have a big mouth filled with razor sharp teeth. A bite from a musky might severely ruin your day, but it is almost certain death to those animals unlucky enough to cross its path. This predator has no real filter for what it decides for a snack: any fish or animal small enough to fit in its mouth will be made into food. Favorite meals include any fish even remotely smaller than they are, crayfish, small birds such as baby ducks, snakes, frogs, mice, and even muskrats paddling across the water. The rule of thumb for a musky is that if they can possibly swallow it, they most likely will. Where Can You Go Musky Fishing? These fish are not too difficult to catch once you know the tricks. Finding the right location may be one of the most difficult tasks, and that really does vary depending upon the environment you are fishing in. For best results, read up on musky fishing reports for your area and consult a local expert. In general, however, muskies tend to stick to shallow areas with grassy coverage, especially in lakes. 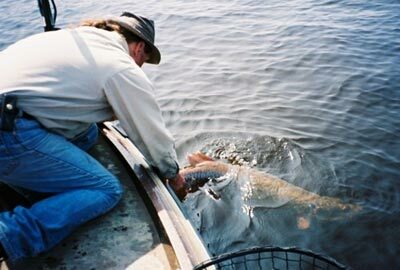 When river musky fishing, the best places are often the river mouth itself, an ideal ambush location for muskies. If you choose to go musky fishing, Canada offers some solid opportunities and there are plenty of tours and travel resorts that cater to this species of fish. Since musky are not the most common fish out there, be wary of the varying fishing regulations for whatever region you're musky fishing in. Depending on what season it is, muskies tend to go after different bait that suits their changing metabolism. They are much bigger eaters during the summer and fall season when they are getting ready for winter, while during the colder months muskies aren't nearly as gluttonous. Knowing what bait works where and how much to use is the real key to success for musky fishing. It should also be noted that no matter where you plan to fish for musky, catch and release is a great idea to help these fish grow their numbers. Muskies grow slowly and do not reproduce as quickly as most other freshwater fish, so try and release as much as you can to help stave off overfishing. If you plan to plan to keep what you catch, be sure to abide by the regulations for your area. What Makes Musky Fishing Exciting? A popular nickname for the musky is 'the fish of ten thousand casts,' a fitting name for a fish that can be quite difficult to bring in. Not only do their sharp teeth cut through line, but their head-shaking, jumping-out-of-water style of fighting increases the chances of not only broken lines, but hooks as well. Using the right musky fishing equipment is essential for success, but even then a muskie can find a way to worm its way out of a catch. Musky fishing line can help prevent breakage, allowing you to fight even the greatest monsters - so long as your hook stays strong. These fish can and will fight for an hour or longer, especially in the peak of their lives. It is a truly epic battle and one that few freshwater fish species can offer an angler in North America. The thrill of finally getting the big one up alongside the boat is a moment of total victory. In the end, most anglers are proud to let their catch go free because musky nearly always win the right to fight another day. What Do You Need To Start Musky Fishing? You are definitely going to need heavy duty equipment if you plan to fish for musky. They are not only large and powerful, they are some of the hardest fighters in North American waters. You will need exceptionally strong line and usually a very long lure. Most of those fishing for musky try out a range of lures during any given trip. The goal is to discover what the fish wants to strike at the moment. They tend towards bigger lures because of both their size and appetite, so a 7-inch long lure is not surprising: some even go so far as using a foot-long lure. Having said that, Muskies will bite smaller bait as well, so don't be afraid to try out different combinations until you get something that will work. When using live bait, large minnows and frogs work best. A first aid kit is a very good idea, just in case you accidentally get cut by its teeth trying to handle the fish. You can avoid that with some gloves, but many anglers opt not to wear a pair unless they happen to have had a run-in with a particularly vicious musky. When taking the fish out of the water and into the boat, a net is most useful to avoid getting those cuts. The choice is yours, but safety is definitely advised. If you plan on keeping your catch, be sure to have some kind of ruler to measure its size. Often times muskies, like with most other species of fish, must be of a certain length in order for you to legally take it home. As mentioned above, check out the local musky fishing reports for more information. There are bound to be days when the musky simply refuse to bite, but don't get discouraged! The fight is well worth the effort you put into it.